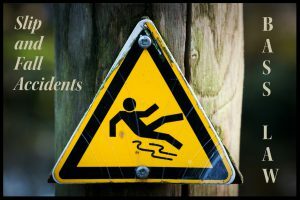 “Slip and Fall” is the phrase typically used to refer to an incident where someone slips, trips or falls as a result of a dangerous or hazardous condition on another’s property. Common locations of slip and fall accidents include grocery stores, restaurants, shopping centers, public sidewalks, parking lots, gas stations and private homes. If you are on someone else’s property and injure yourself because of a dangerous condition on the property, you may be entitled to compensation. WHAT DO YOU NEED TO PROVE TO PREVAIL IN YOUR SLIP AND FALL CLAIM? Under Georgia law, where an owner or occupier of land invites others onto his or her property, the owner or occupier is liable for damages suffered by a person who is injured or killed on such premises if the owner or occupier failed to use ordinary care to keep the premises and approaches safe. To prove the claim, the injured party has the burden of showing that the owner or occupier of the premises knew, or should have known, about the dangerous condition AND the injured party was unaware of the dangerous condition. While this may seem simple, these cases are some of the most difficult to prove. It is crucial that you speak with a slip and fall attorney as soon as possible to ensure that critical evidence is procured and preserved. WHAT STEPS SHOULD YOU TAKE AFTER A SLIP AND FALL? Property owners or managers often clean up, repair or remove the dangerous condition after an injury occurs. Thus, it is important to take specific steps as soon as possible to document the evidence for your claim. Seek Medical Treatment. Even if you believe the injury is minor, it is important to get checked out by a doctor and have a doctor document your injuries. Report the Accident. Notify the property owner or manager of the accident and request that a written, incident report be prepared. Request a copy of the report before you leave. Take Photographs of the Scene. It is important to take numerous photographs as soon as possible after the fall from different angles of the EXACT area in which you fell. Also, make sure to photograph stairs, holes, broken pavement, any slippery substance on the floor or other conditions that contributed to your accident. Gather Witness Information. Write down the names, addresses and telephone numbers of anyone who may have witnessed your fall or who arrived in the area shortly after the accident. Even if someone did not witness the fall, he or she may still be an important witness to confirm the condition of the floor, lighting, etc. or to provide testimony as to an admission of fault made by a store employee or representative. Decline Statements. Limit your communication with the property owner or manager and do not give any statements to the insurance company until you have spoken with an attorney. If you or a loved one has been injured in a Georgia slip and fall accident and would like to discuss your personal injury claim, contact Bass Law to schedule your free, no obligation consultation with Attorney Dondra Bass O’Neal. You may contact us directly through this website or by calling 912-344-4294.